Thank you for visiting my running blog. After my longest run to date last weekend, Monday started off with a gentle 4 mile recovery run in the sun. With some trepidation and minor twinges, I headed to my yoga (Ashtanga) class on Tuesday. It was a great class and, although it’s always a lot tougher than it looks, it was the perfect way to stretch troublesome areas and rest the mind. I really am surprised why more runners don’t practice yoga – I find it really helpful and good fun. Wednesday was a very busy day at work and my usual lunchtime run didn’t happen. Instead, that evening I headed to the dreaded treadmill in the gym for 5.6 miles of plod, plod, plod. Chilly Thursday saw me running in Green Park at lunchtime. I was planning to run Fartlek but my legs felt tired so I ran steady pace for 3 miles and then a faster mile to finish. Friday was a much-welcomed rest day. Today’s (Saturday) snowy 16 miles in the parks was a new longest run for me. My mental toughness and focus is strengthening and it feels so good! According to Wikipedia, a 2009 poll of 4,000 British adults voted jelly babies their 6th favourite sweet. A few of them helped me on my way and, right now, I agree with those 4,000 Brits. Next weekend I’ll be running the Bath Half. Juliet’s running too and we’ll be supported by Juliet’s sister, Clare. We have a great weekend in Bristol planned and I can’t wait. It will be only my second ever half marathon and my fingers are crossed the weather will be a lot better than it was during my previous half in Marlow – check it out. http://www.youtube.com/watch?v=J2bp6-SI3gA. Things are looking good for the talk I’ve arranged by Mark Rowlands (author of The Philosopher and the Wolf and the forthcoming Running with the Pack) in central London on 4 March – hopefully meeting Mark and hearing him talk will inspire me and others who love to run. I’m running the 2013 London Marathon for Mencap. I’m tantalisngly close to achieving my fundraising target. I would be enormously grateful for any support you could give me. Please have a look at my sponsorship page! I am running the London Marathon on 21 April. It will be my first ever marathon and I’ll be running for Mencap. My blog attempts to chronicle my training for the big day, with some thoughts thrown in for a bit of light relief. ‘Most of the serious thinking I have done over the past twenty years has been done while running.’ Mark Rowlands. I’ve not been running for long but from my experience of the sense of freedom I get from it, I completely understand how Mark has benefited from his running. It’s a time to un-jumble thoughts and create a space for clarity of thought. It’s true that towards the end of a long run, my immediate thoughts turn to getting enough air in my lungs and energy into my legs to finish, but before I reach that point the head has cleared. This has served me very well this week. It’s nearly time to lay to rest my first ever pair of running shoes. After nearly two years use, there is still some use left in them but they are now only destined to accompany me to the gym and spin classes. I have a special sentimental attachment to my shoes (I call them shoes now, not trainers!) as they were a Valentine’s present from Juliet, who got me into running (for which I will be forever grateful). The shoes comforted and supported me throughout my first few (very) tentative miles, my Serpentine Handicap runs and my first 10 mile race – the 2011 Cabbage Patch 10. I have a newish pair of shoes (the same model – Asics GT-2160) to turn to now but I’m worried that particular model is being replaced by a newer but not necessarily better entrant. I’d welcome views on the newcomer – Asics GT-2170. Less miles this week – phew! Six miles on Tuesday lunchtime, spin class on Wednesday night (it felt particularly tough this week!) and another 6 miles on Thursday lunchtime. Friday was a rest day (delicious lunchtime omelette and chips in the work canteen). Saturday was my first Serpentine Handicap since last September – 4.3 miles at pace around the Serpentine in Hyde Park in beautiful sunshine. Incredibly, I won the race and achieved a personal best! 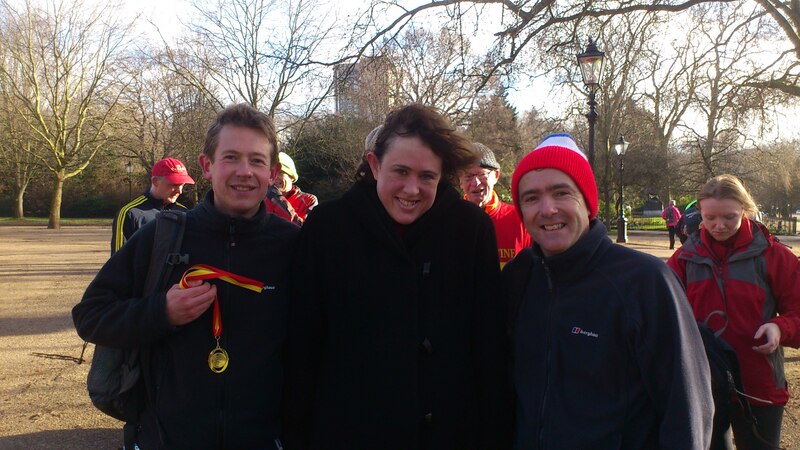 It was my sister-in-law’s (Clare) first ever handicap race – she did really well! Juliet ran her quickest for months – well done flower! The race was followed by a restorative muffin and coffee with Serpies. Celebrating a win with Clare.